I made these cards for a Demonstrator swap; I hope the ladies like them! 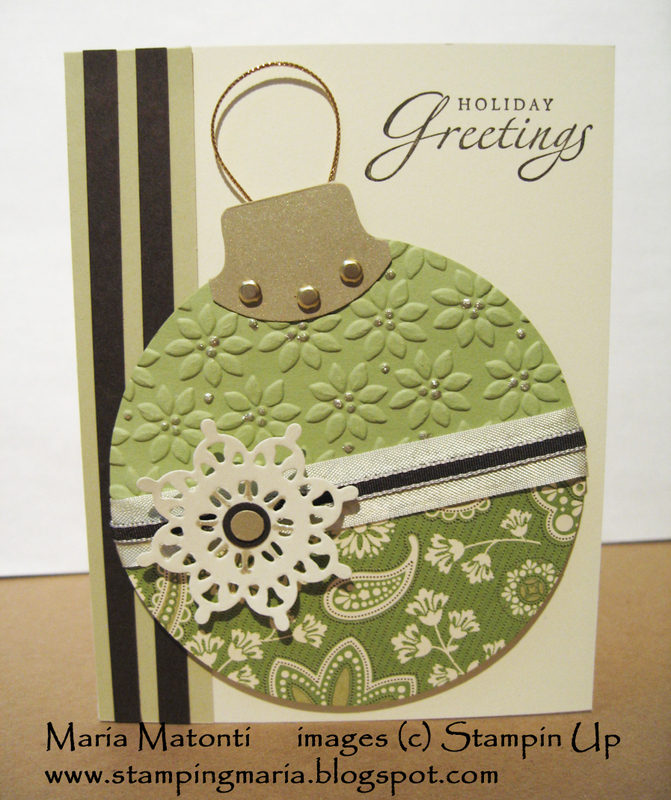 I used the Big Shot Machine and the Bigz Clear Circle Die to make the ornaments on the card. After die cutting the ornament base, I ran it through the Petal-a-Plenty Embossing Folder to give it a little more character. Finally, I dotted some Champagne Mist Shimmer Paint on the embossed image. 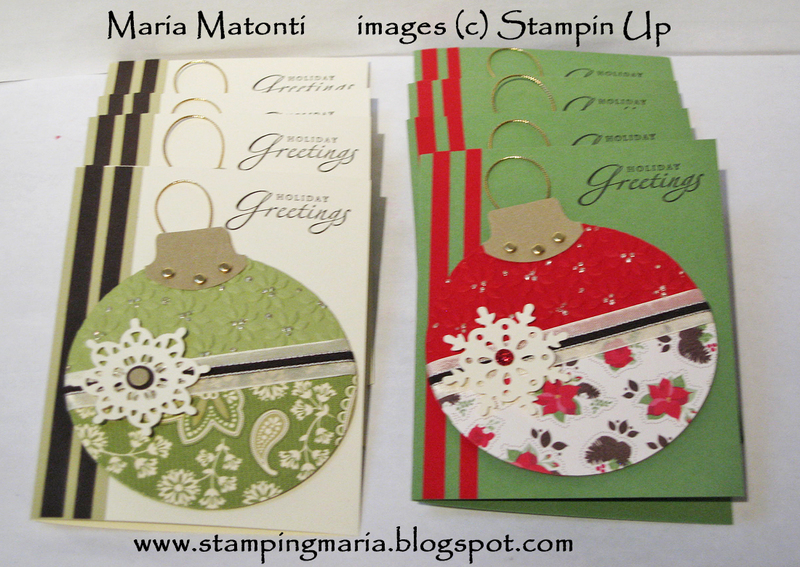 I wanted a Christmas card that could get mailed with no problems and that was EASY and QUICK to make! Added after post: After I completed the cards and posted here, I had the desire to add a finishing touch; I sprayed them with Champagne Shimmer Paint mixed with Rubbing Alcohol to give them shimmer and shine! Cardstock: (first card) Real Red, Wild Wasabi, Red Glimmer Paper, Brushed Gold, Holly Berry Bouquet DSP, and Very Vanilla; (second card) Early Espresso, Pear Pizzazz, River Rock, Very Vanilla, Brushed Gold, and Spice Cake DSP. Accessories: Big Shot machine, Clear Circle die, Petals-a-Plenty Embossing Folder, Round Tab Punch, Gold brads, Vanilla seam binding ribbon, 1/8" Espresso taffeta ribbon, Northern Frost Decorative Strip die, Itty Bitty punch pack, 1/4" circle punch, Champagne Mist Shimmer Paint, Stampin Dimensionals, and gold cording (retired). The card base is 8 1/2" x 5 1/2" scored at 4 1/4". 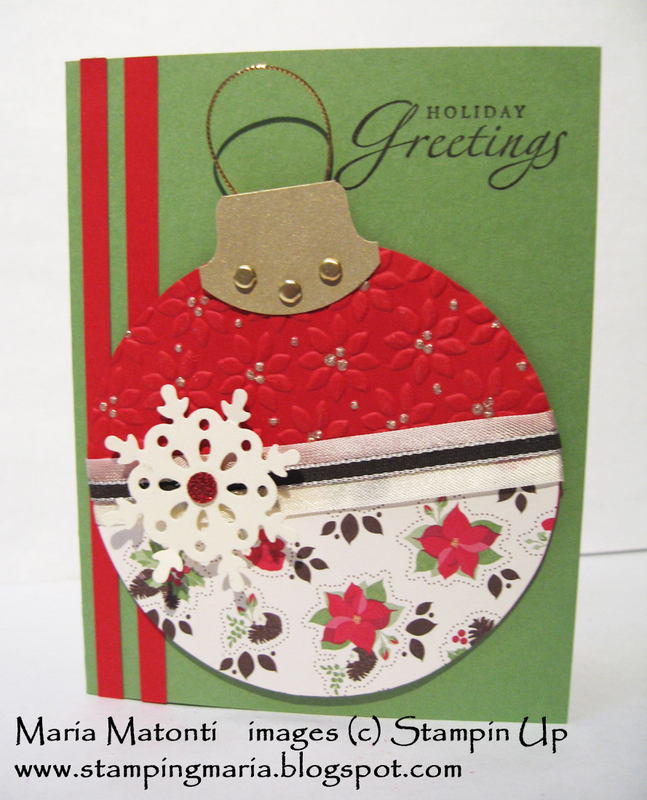 The ornament is 3 7/8" in diameter and the strips on the left side of the card are made of cardstock measuring 1/4" x 5 1/2". I got the card layout from fellow demonstrator, Betty Gillespie a couple of years ago. 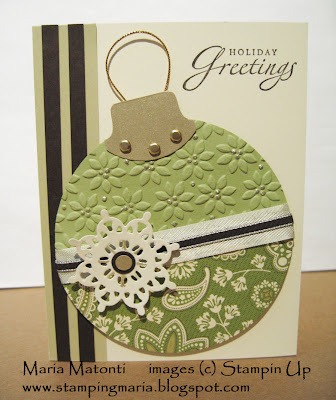 I loved the card and thought I'd use it this year with this beautiful Designer Series Paper; thanks Betty! I hope you like the cards and contact me if you have any questions. Thanks for stopping by and have a great weekend! These are gorgeous! I love that you used the Spice Cake for a Christmas card! !